From page to stage, Stanton Welch brings his original spellbinding production back to the Wortham Center. Melody Mennite soars as Cinderella. Audiences won't find helpful mice or a distressed damsel in Houston Ballet artistic director Stanton Welch's 1997 original ballet, Cinderella, which graces the Wortham Center stage through March 12. Welch's forward-thinking storyline hearkens more toward the Brothers Grimm 19th-century folk tale; less from Charles Perrault, who also penned Sleeping Beauty and Little Red Riding Hood, and his lofty 17th-century story. Regardless of similarities amongst past fairytale iterations—wicked step-mother, malicious step-sisters, grand ball, slipper search—this is not Disney on Ice, as Welch's beautiful choreography and broadening storyline recasts the tale-as-old-as-time princess plot with Cinderella as the literal lead this time, taking control of her life and destiny. "I wanted to break the traditional mold of Cinderella needing to rely on a mythical force of the Fairy Godmother and, then later, the Prince to rescue her," Welch says. "I much preferred a heroine who could take charge of her own life and make her own choices independently—a message I hope the audience can be inspired to follow." 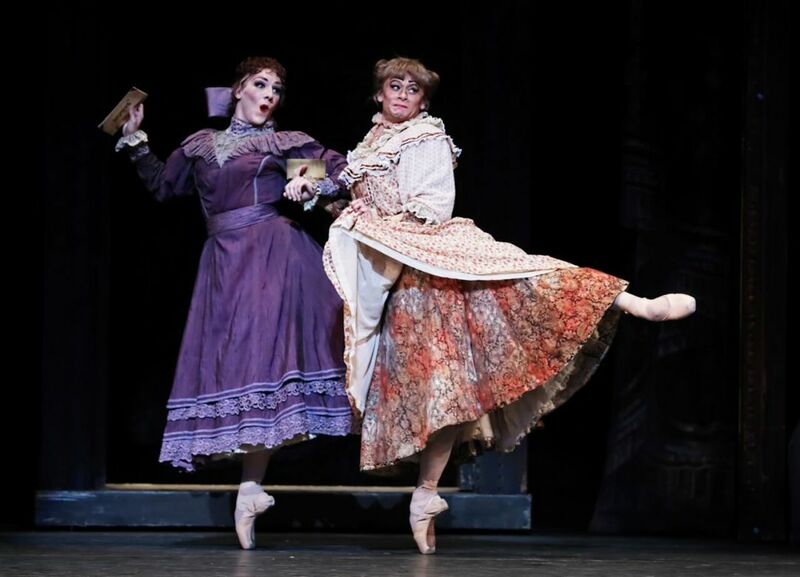 Hayden Stark and Derek Dunn are en pointe as Cinderella's mincing step sisters. 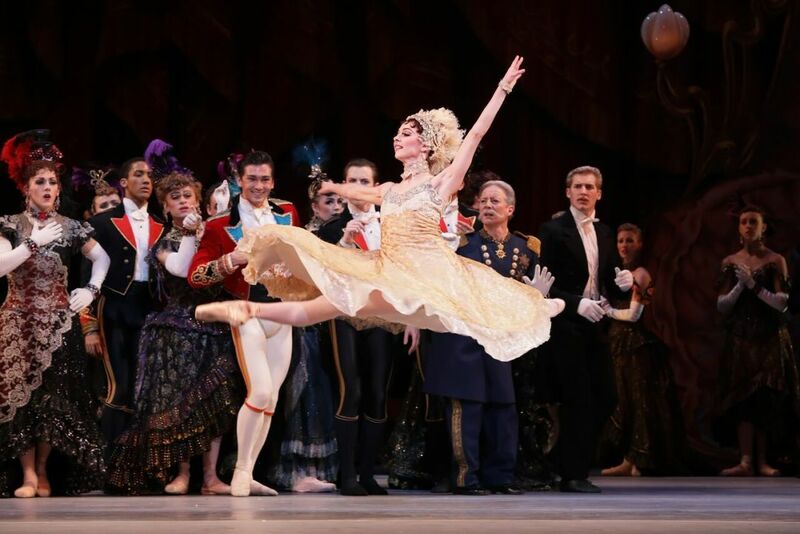 Principal dancer Melody Mennite does just that, bringing long-awaited comedic gusto to Cinderella as a scrappy tomboy who stands up for herself against her ruthless step-sisters, played purposely graceless by Derek Dunn and Hayden Stark, who still managed to wow the audience (in pointe shoes, no less! ), along with her vile step-mother, Oliver Halkowich, who embodied the theatrics of the role, reminiscent of Tony Curtis in Some Like It Hot, all the way to the curtain call. An eerily beautiful supernatural crypt sets the third scene as Cinderella visits the spirit of her mother (Jessica Collado) in a graveyard, conjuring friendly, zombie-like ghosts (with a flair for Michael Jackson's Thriller) to outfit Cinderella with a magical dress for the ball, sans mice, while also transforming her buddy and chimney sweep Buttons (Christopher Gray) into her regal page for the event. However, similar to most iterations, when the clock strikes midnight, Cinderella transforms back to normal. Ian Casady and Melody Mennite as Dandini and Cinderella. Unlike most retellings, the Prince (Charles-Louis Yoshiyama) is anything but charming, except for Yoshiyama's stellar performance as the self-centered suitor, setting the stage for Cinderella's jaw-dropping entrance to the ball, where Mennite descends a peacock-inspired stairway into the party. But instead of the prince, it's his secretary Dandini (Ian Casady) that catches the eye of Cinderella—and the audience. When the duo dances to Sergei Prokofiev's original 1945 ballet composition, led by Houston Ballet music director Ermanno Florio, even the hardest hearts will flutter. I won't spill which courter chooses Cinderella, because Welch's vision is about who Cinderella chooses, a fairytale ending that's long overdue. "Indeed, my Cinderella is no downtrodden waif but a gutsy tomboy," Welch says. "She evolves into a strong-willed woman who stands up for herself and is able to choose her own path, her own love. A real Texas woman!"